What is BASIS PROMPT ? 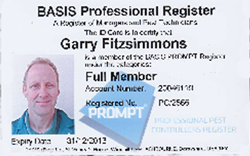 BASIS PROMPT is an independent industry/government recognised register of professional pest controllers who have achieved the required level of competence and have invested time in keeping their knowledge and skills up-to-date. 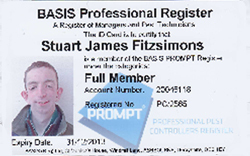 BASIS PROMPT registration certifies that our technicians have received a high standard of training (RSPH Pest Management Level 2 is a required qualification to join) but also to remain on the register our technicians must be prepared to spend time keeping up-to-date through Continuing Professional Development (CPD). ACPC are committed to a progressive approach to training ensuring we continue to provide the very highest standards of pest control for our customers.